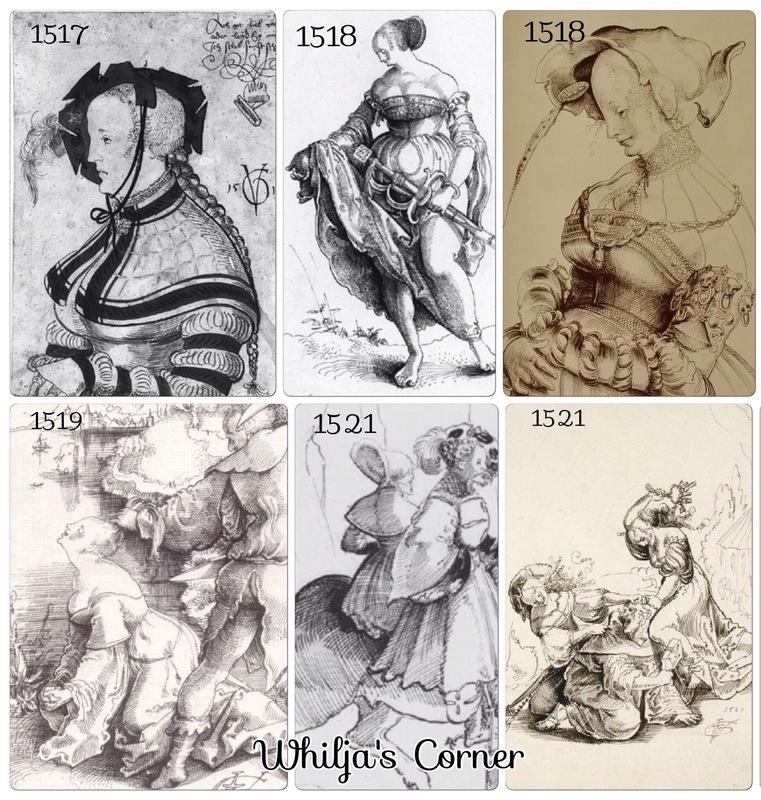 Since the whole dress on my woodcut isn’t really visible and doesn’t provide any specific details, I collected woodcuts made by Urs Graf, and sorted them into chronological order to better get an idea of the evolution of a Swiss dress from around 1500 and up to around ten years after the woodcut I based my sleeve on. – the neck line is rounded and very low cut both in the front and back. – some necklines is even so low cut that they goes underneath the bust. 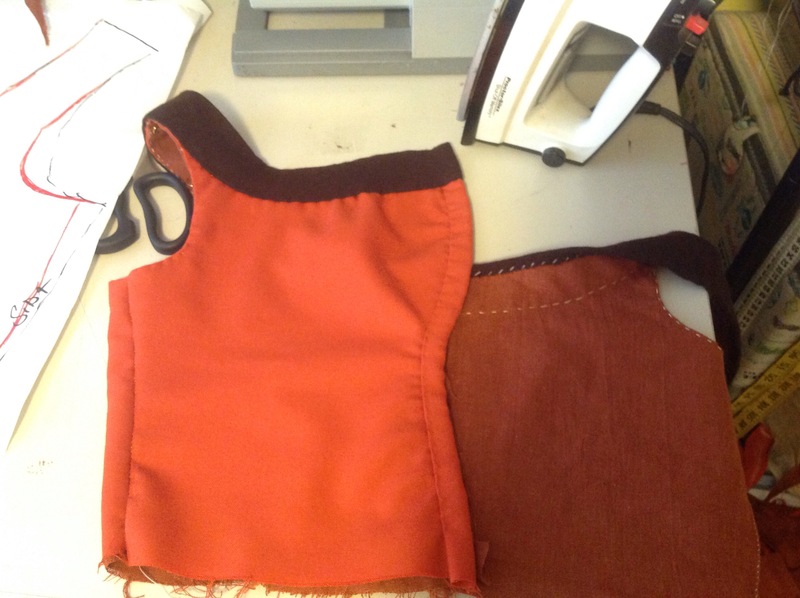 – the skirt is very full, but doesn’t have that much of fabric around the waistline, which indicates a triangular cut. – front opening seem to be common, and some woodcuts even shows a large opening in the front of the skirt. 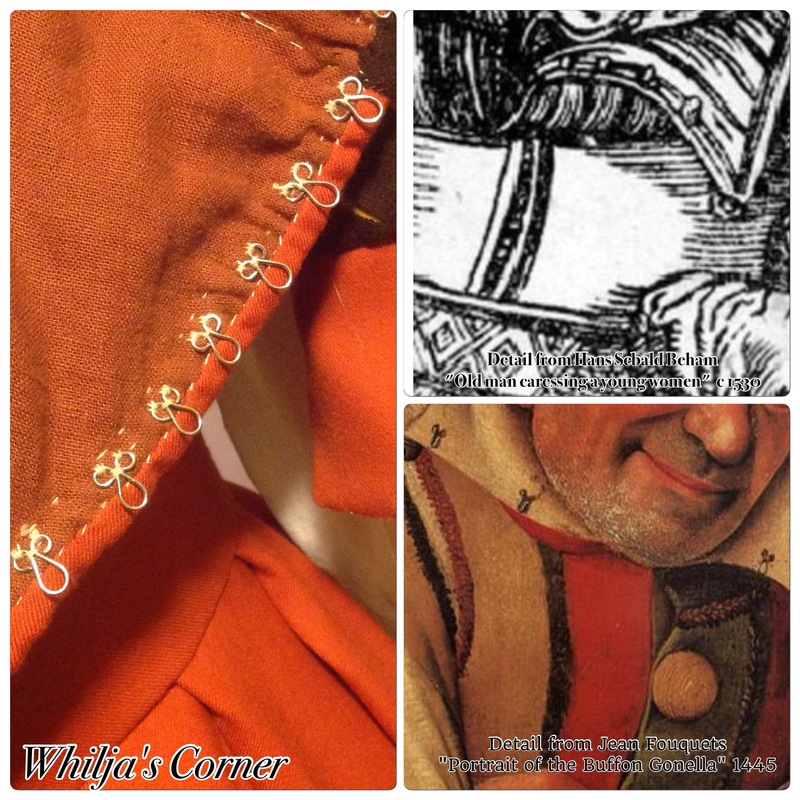 I favor the four panel construction of my bodice, since it gives more control of the fabric to shape it to fit me properly, and one of the woodcuts from 1514 shows a shade in the back of her that might indicate a backseam. 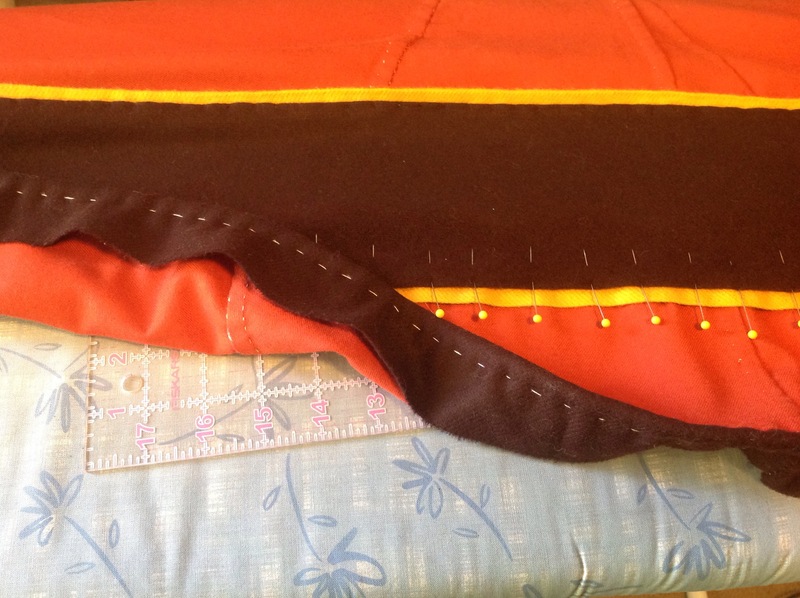 After I finished my bodice, I realize that the low cut back made a backseam a bit unnecessary, and since I have to move the front patterns sides backwards anyways, I will remake the swiss pattern into three pieces for the next dress since it will save me some sewing time. When working on the shoulder straps I become a bit suspicious that the woodcuts might be a bit exaggerated; how can you move your arms if you have a dress hanging over them? 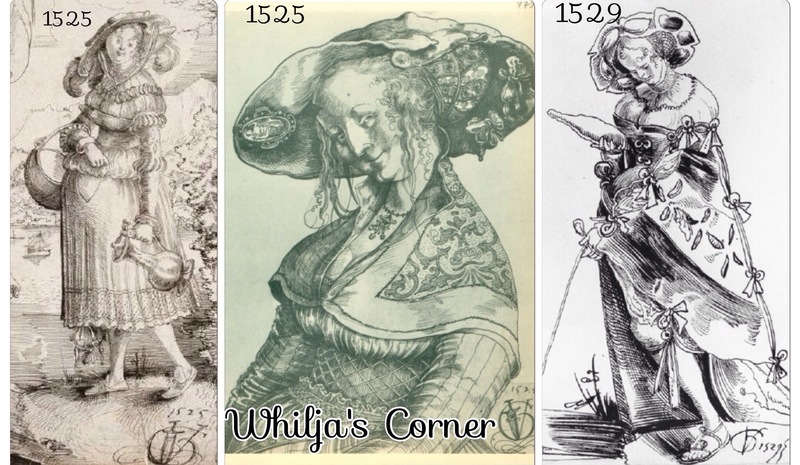 To be sure that Urs Graf’s woodcuts is actually showing a correct dress, with broad shoulders, I started to look for other Swiss paintings from this period. Since I already had sewn the hooks and eyes on the inside of the dress, I needed a solution to hide the stitches (because I didn’t wanted to remove them all and do it all over again) so I ended up hiding the stitches with a folded piece of fabric around the front edge. Next dress I’m hiding the hooks between the layers instead. The hooks and eyes are made out of an 18 gauge silver plated bronze wire and attached on the inside with stitches through both layers of fabric. During the last years I’ve been trying to increase the amount of documentable techniques, tools and supplies. Since I havnt found any sources of using dyed linen thread, (and the dress is supposedly based on a woodcut for a Campfollower, so silk thread isn’t an option), I use a natural linen thread. The thread is therefore hard to hide, so the focus is to just keep it as invisible as possible on the outside, while I let it be shown on the inside. 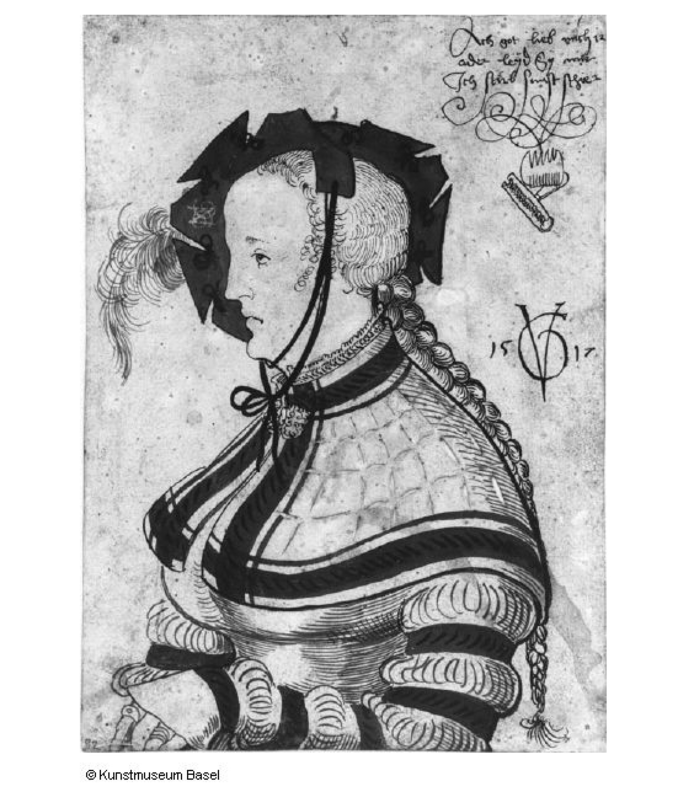 C. Aneer in her thesis “Skrädderi för kungligt bruk” (Uppsala 2007) have a section about the quality in stitches from a variety of clothes (c 1600-1615) from the a Swedish Royal Armoury, where she reflects over the low quality of the stitches, that the clothes seem to be basically whipped together with no more care then to hold, rather than showing off an elaborate tailoring skills with high quality seams. (Underwear is a different subject; they are incredible neatly stitched together). It might seem plausible consider that outerwear probably isn’t going to be washed in the way as underwear, and therefore doesn’t need the same strong and neat seams as underwear would require. My thread is therefore visible on the inside and I tried to use just enough stitches to ensure that the dress wouldn’t fall apart …which didn’t really worked since my muscle memory was still set for tiny stitches after the last major project “The Sture Shirt”. I did though use a larger amount of whip stitching then before and the bodice is therefore whip stitched instead of sewn with back stitches. 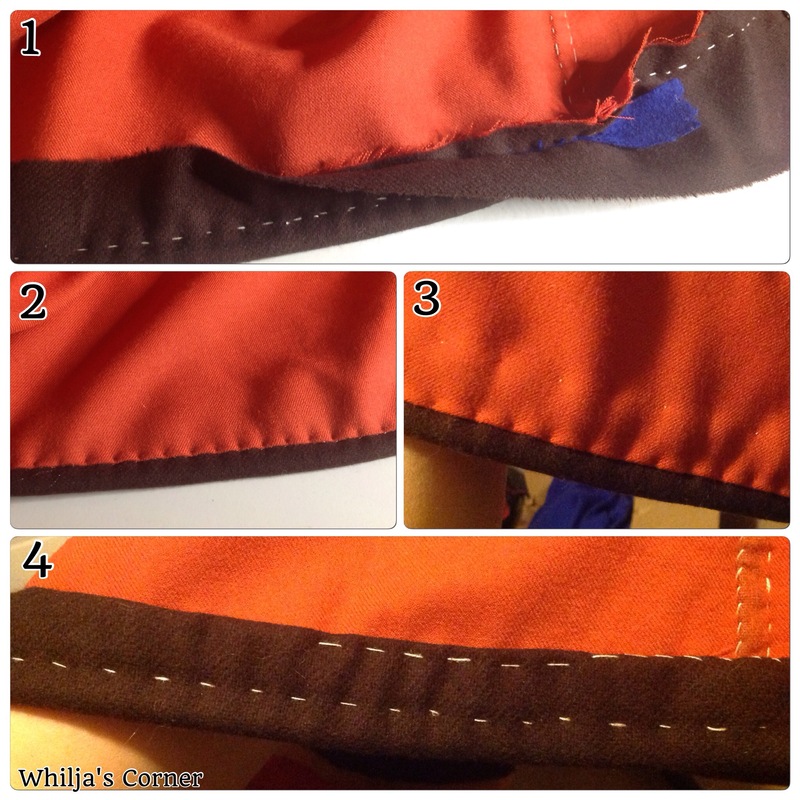 The fashion fabric is wipstiched from the inside, and then the lining is wipstitched. 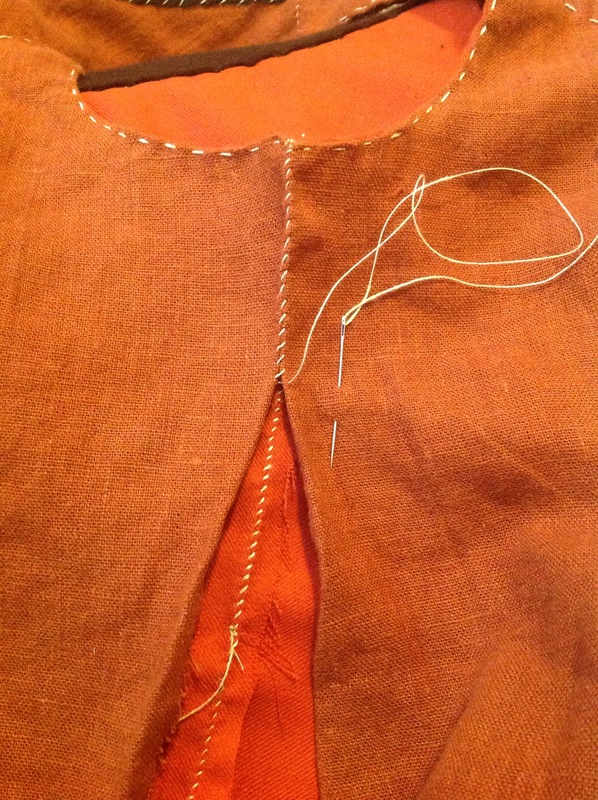 The picture also show the stitches of the inside of the arm hole, the seam is prick stitched on the outside …and due to lack of economical resources at the moment, I had to use a coloured linen i already had, to line the bodice, instead of buying a natural linen which would have been more historical accurate. That descion was a bit hard to do, but sometimes the mundane life doesn’t cooperate with your perfect ideals. 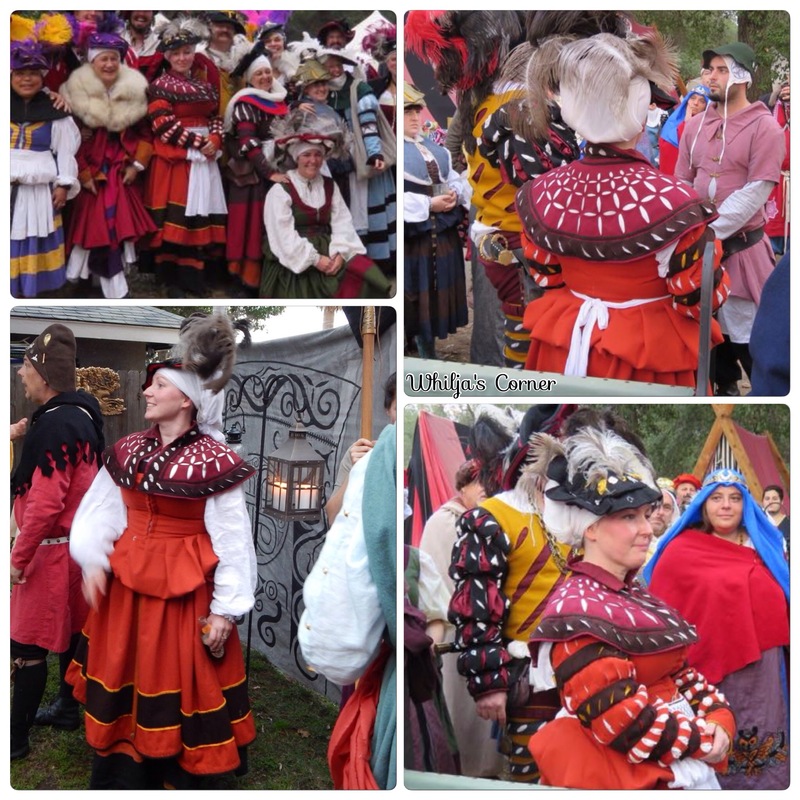 The guards on the bodice is made by a straight piece, pinned down and steamead to form around the corners in the front and back. By using the light coloured thread, I decided to let the guards fold over and then simply stitch it on the inside. 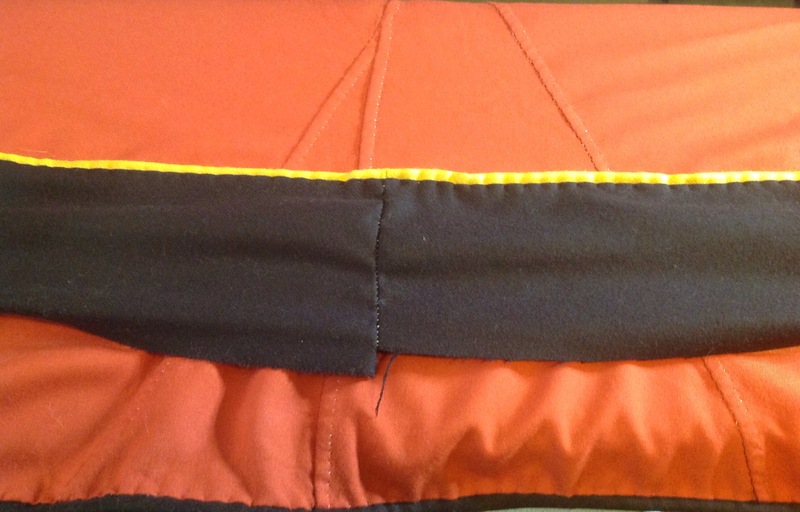 The inside edge isnt folded to keep the layers of wool to a minimum. Since the sleeves need to be attached by a cord, and i cant find any sources of possible easy-to-use solutions, i decided to simply just add three rings on the inside around the top part of the shoulder, where the corde from the sleeves easy can be slipped into and would not be noticed when i choose to wear the dress sleeveless. This was the most interesting part because I had the opportunity to try a couple of new techniques! 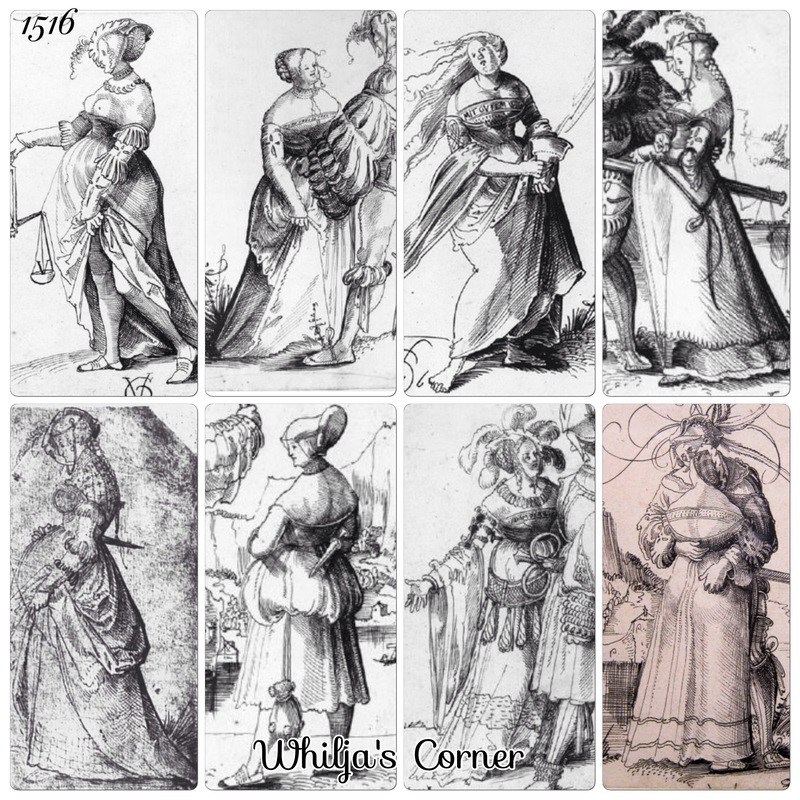 The woodcuts shows that all the skirt has a distinct fall that most probabl can only be achieved with some sort of triangle cut of the fabric (…rather then the rectangular tube construction I use when making German garb). When searching for input of different ways to achieve that look, I study both Mistress Ariana and Mistress Julianas half circular constructions an decided to try one of the Alcega constructions. 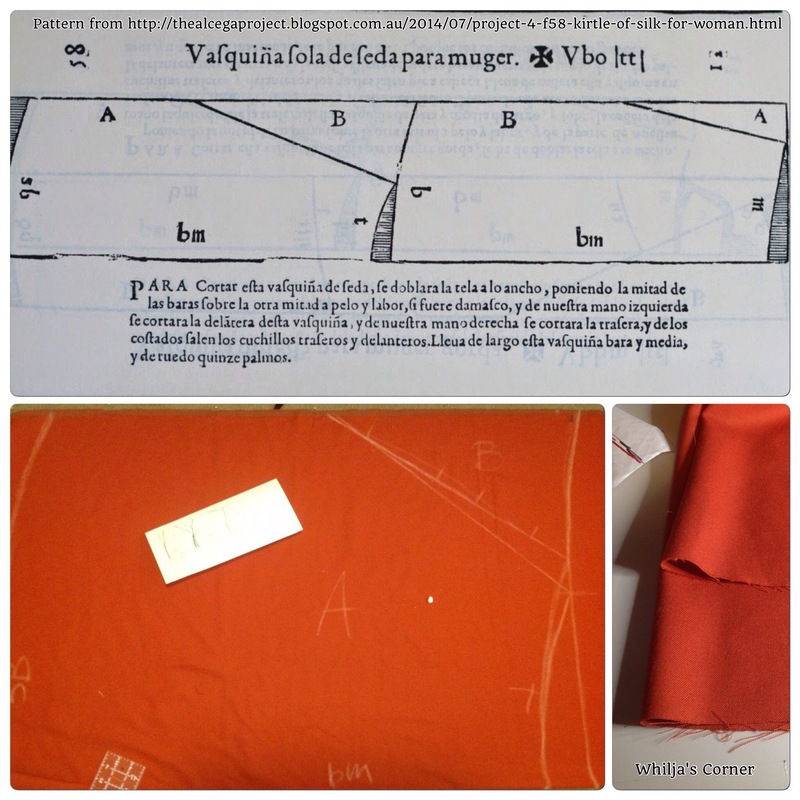 One of the impressive works that is being done is one mans project of making mini reproductions of the Alcega patterns, and his research helped me quit a long way to easy achieve the look I was aiming for. If you havn’t seen The Alcega Project yet, please take a moment to look at his blog, it’s a joy to read! 1) The brown fabric is back stitched to the edge, then folded over a piece of double folded left over heavy weight wool fabric I happen to have in my scrap stash. Small running stitches keeps the inner layer of wool in place. 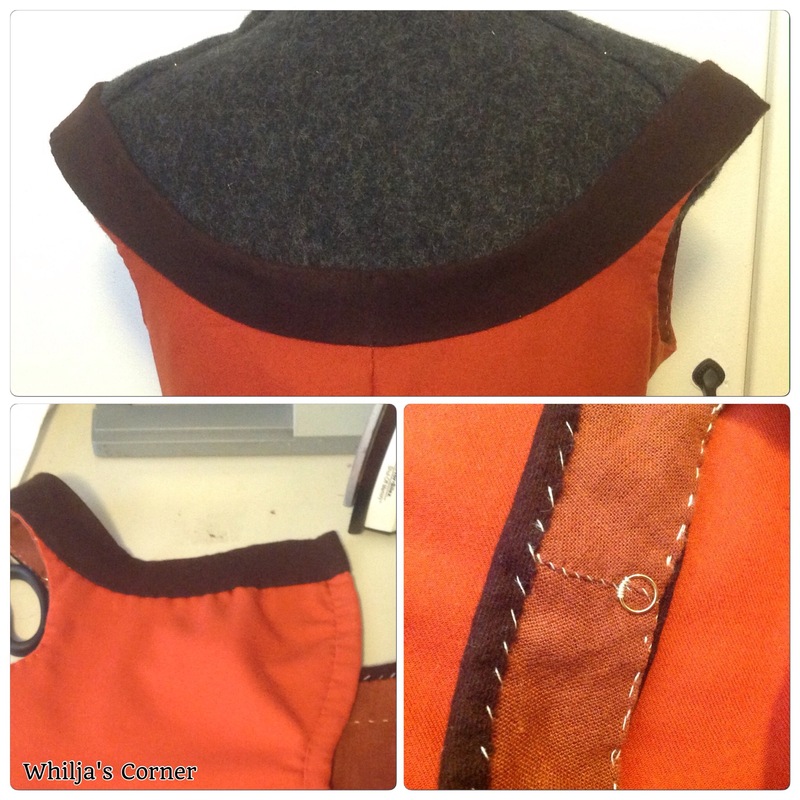 The width of the brown fabric is simply decided by the fact that I use a light weight wool which makes the final stitches very visible, so I went for just about 1 1/2″, enough to give stability, but not too wide so I kept the front side stitches close to the hem. 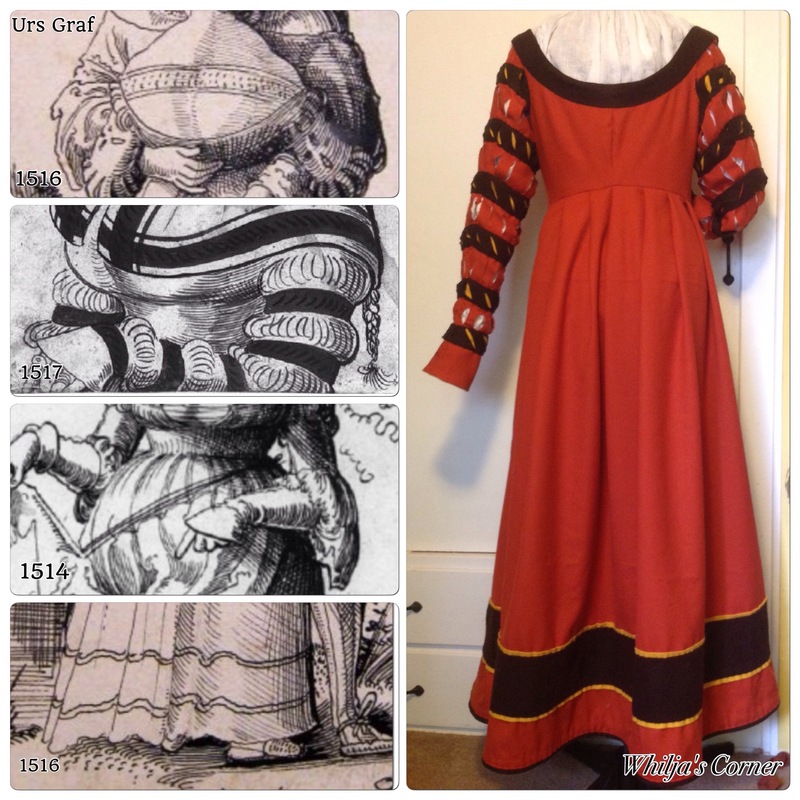 There isn’t that many 16th c Swiss dresses with a decorative guard on the skirt, but since the dress is planned to be worn with out the fancy sleeves, I wanted to add something extra to cheer it up a bit …and also challenge myself to try to add a straight piece of fabric to a curved skirt. The original woodcut doesn’t show the full figure, which gave me some freedom to design the rest of the look on the dress, and I decided to use this guard design because it gave me the opportunity to add both brown and an additional yellow colour. 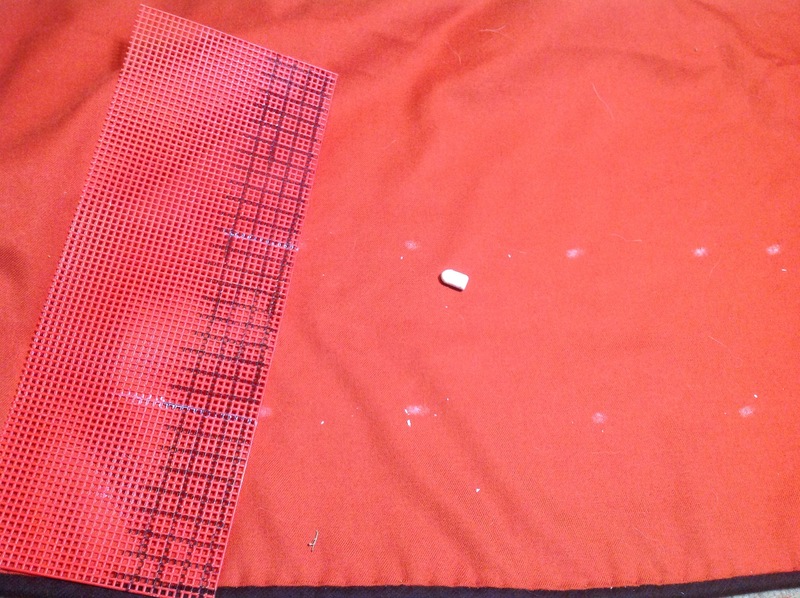 The reason I choose to finish the hem before adding the guard was to make sure I had an even edge to work from when marking out the path of the guard (my Smocking ruler was very handy to use). The top part is pinned and stitched first, since it’s the shortest length due to the cut of the skirt …the bottom part need some stretching before its pinned, and I wanted to be sure that the top wasn’t going to move. 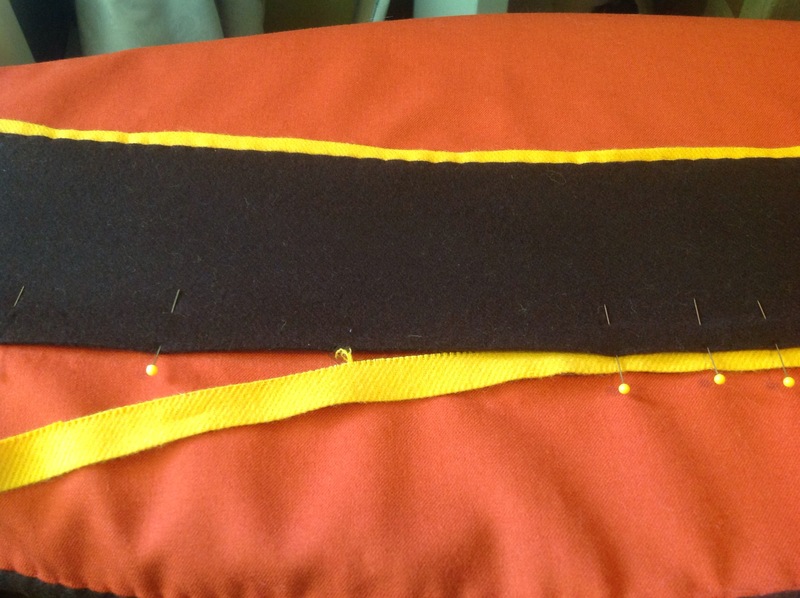 The yellow wool is simply double folded and slipped in between the lathe here, saving me some sewing time. Before picture of the guard before its steamed and ironed flat. 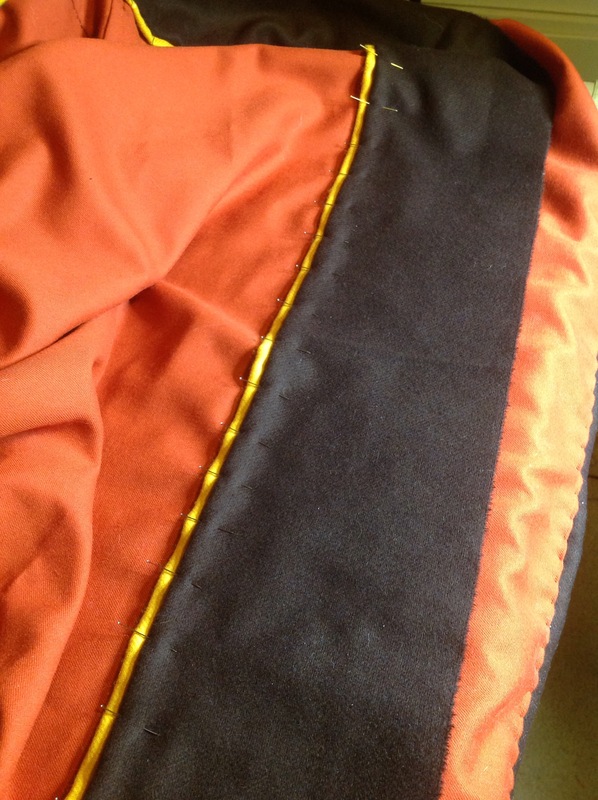 The construction of the skirt with the straight front and the flares on the sides, actually made this step easier then anticipated; I basically just need to start in the front and back and pin the guard against the sides until it started to crinkle, and then I steamed the fabric between this two points to form the guards to follow the curve of the skirt. 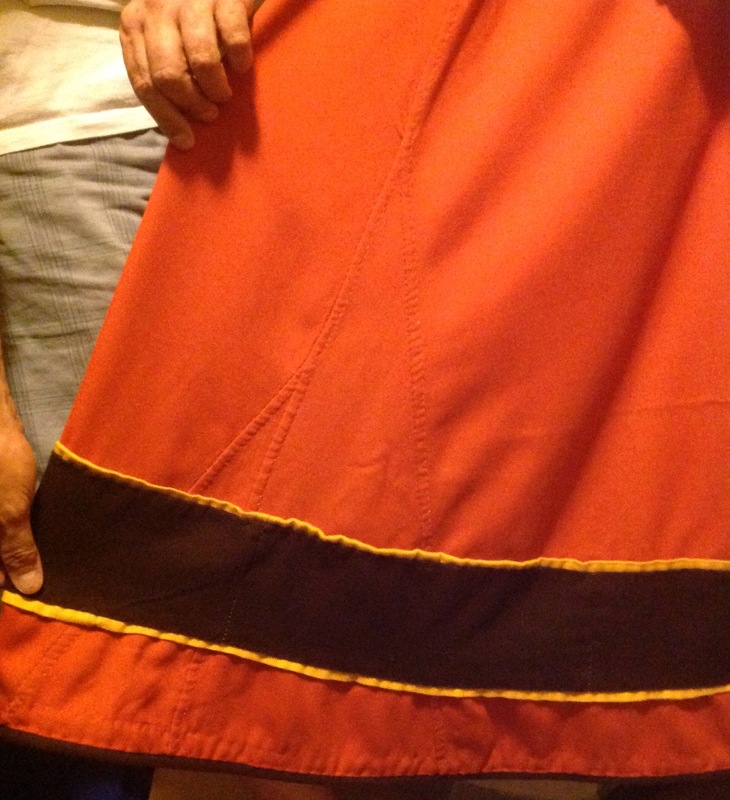 …then all its left is to attach the skirt to the bodice, in this case I used evenly rolled pleats (woodcut number 3), attach the inner lining to the skirt and attach the sleeves and take a picture of the dress hangin on my dress form, until I can use it for the next event! 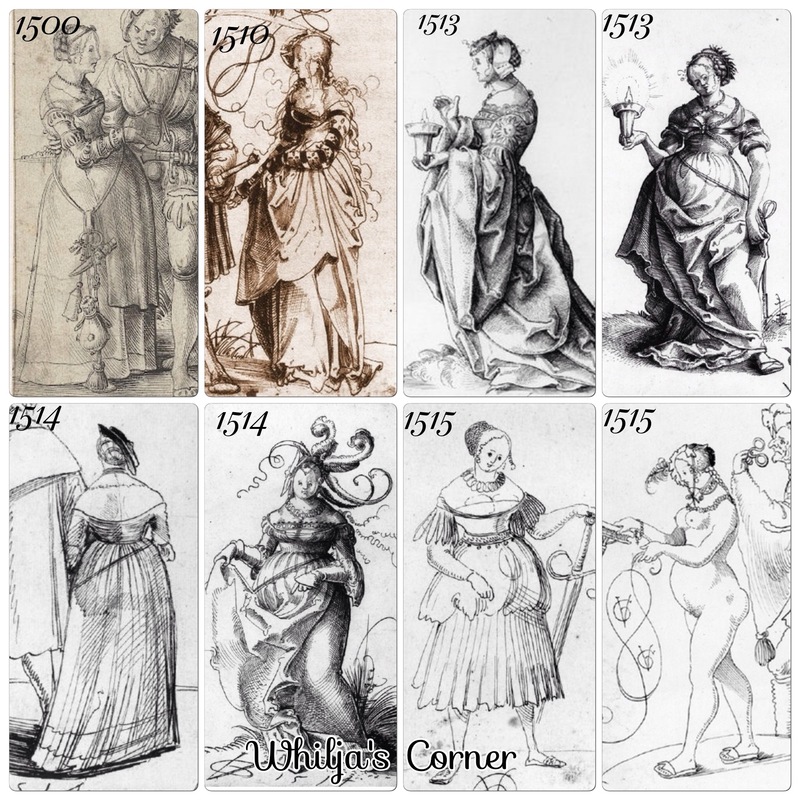 Woodcut 1 and 4 is the same woodcut, and shows the inspiration for the neckline and the guards. Woodcut number 3 shows the inspiration of the pleating technique I used. 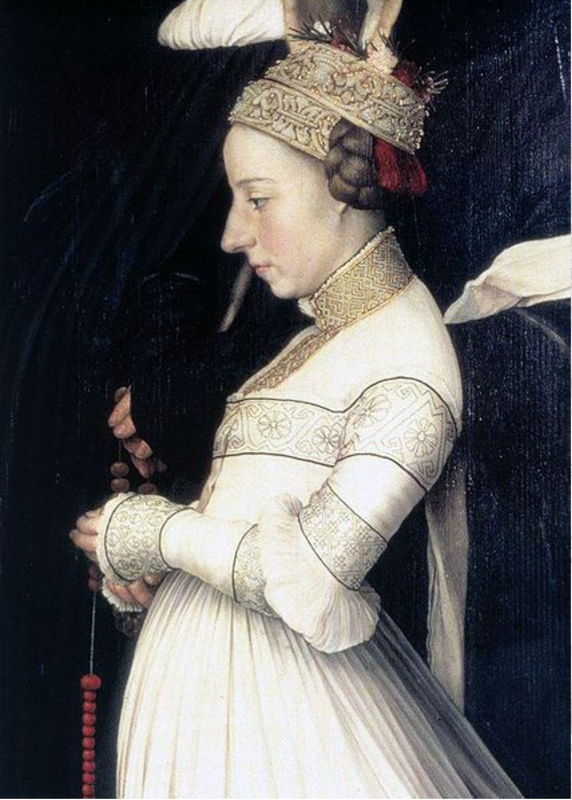 This entry was posted in Sewing, Trossfrau and tagged Alcega, Campfollower, Kamfrau, Reisläufer, Swiss 16th century, Trossfrau, Urs Graf. Beautiful blog! Congratulations! I love whitework embroidery and drawn thread as well. 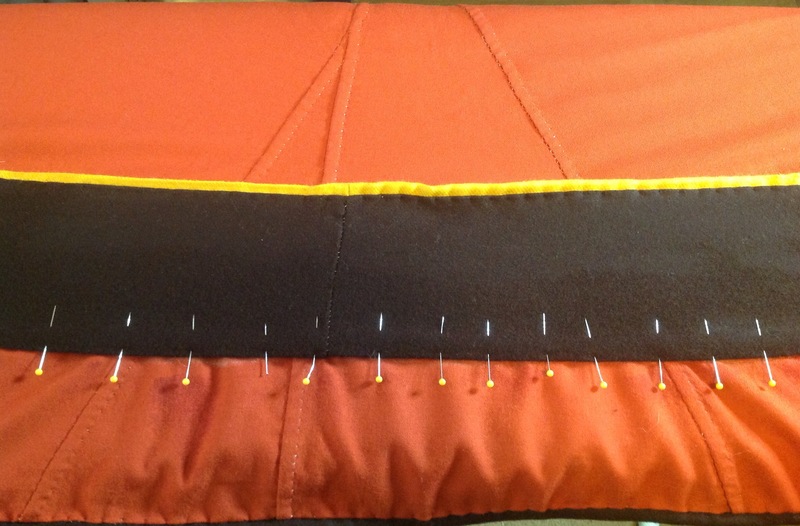 Your sewing skills are amazing. Thank you! I’m happy to hear that you enjoy my blog.